Dozens upon dozens of articles are published every week in any given niche. It’s almost impossible to keep up with this much content, making a weekly newsletter filled with a collection of the best and latest articles a highly useful resource. Let’s go over a few different ways to create and publish a newsletter of this kind. WP RSS Aggregator is one of the most popular RSS aggregators available for WordPress. 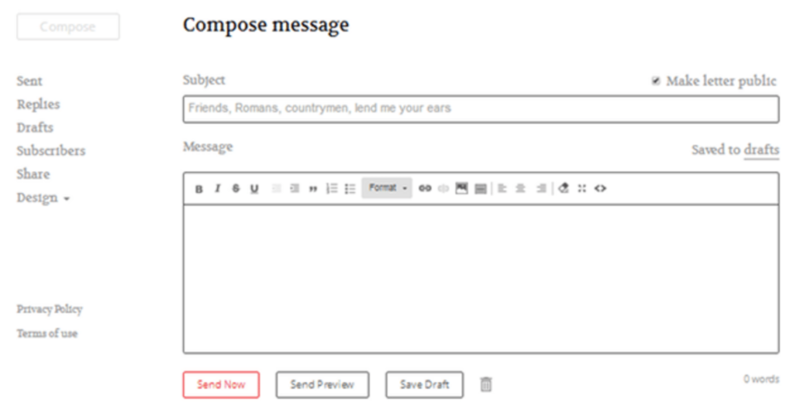 You can use the premium Feed to Post add-on available for this plugin in combination with the MailPoet Newsletter plugin to send out a weekly newsletter filled with a collection of news updates inside of WordPress. 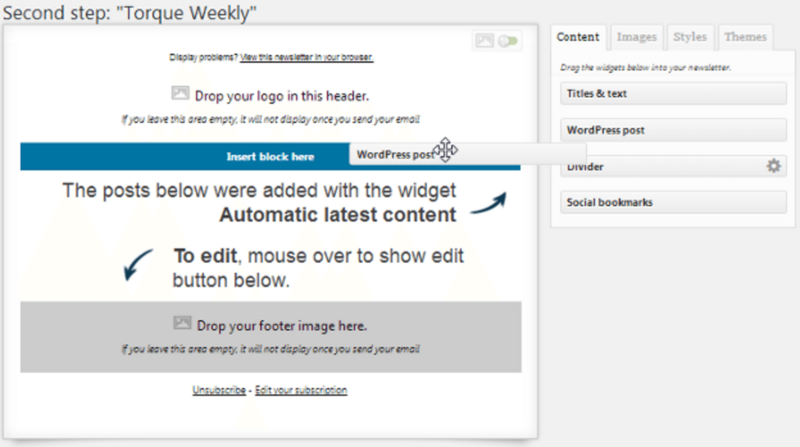 Start off by installing the WP RSS Aggregator plugin and the premium Feed to Post extension. Create a regular WordPress post or custom post type, and use the Feed to Post extension to pull in RSS feeds from different sources. Every new post or story your sources publish will appear in this post when the Feed to Post feature is activated. Next, you’ll need to install the MailPoet Newsletters plugin. This plugin lets you send out newsletters from the WordPress admin area. It sends your newsletters to users who have signed up to your site by default, but you can also go to MailPoet > Subscribers to import your email list from services like MailChimp or Aweber. When you’re ready to publish your first newsletter, go to MailPoet > Newsletters, and click Create a New Email. 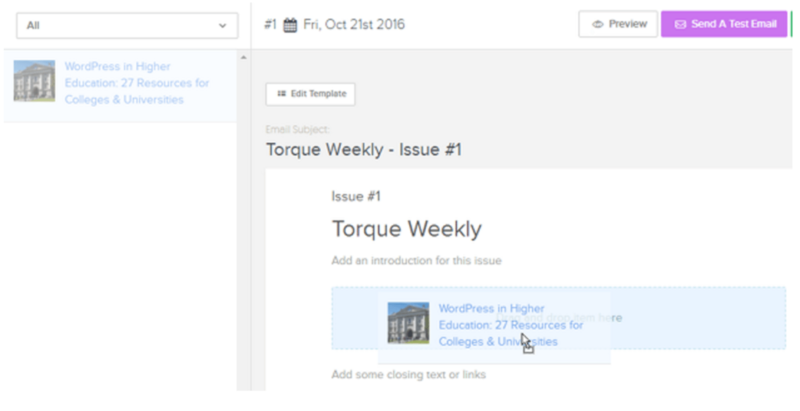 Using the premium Feed to Post extension of the WP RSS Aggregator plugin with MailPoet Newsletters lets you automate the process of publishing a weekly newsletter. 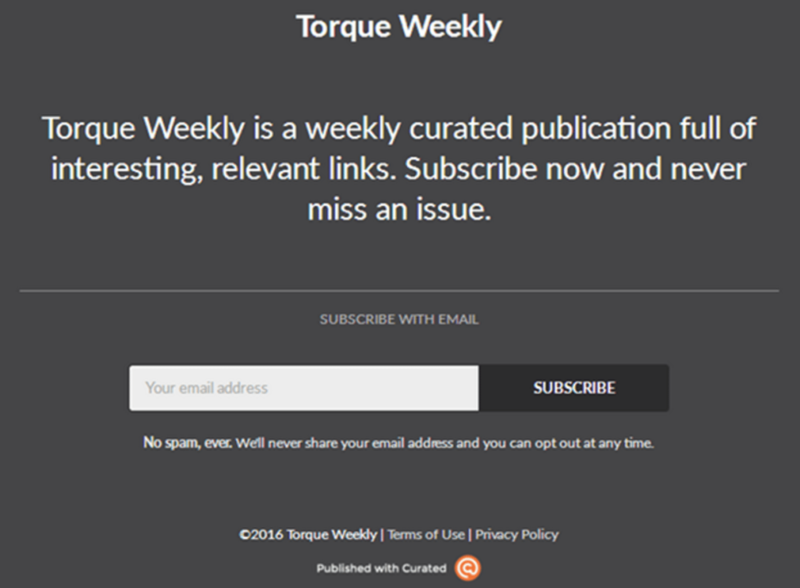 Choose Automatic Newsletter if you’d like a hands-off approach to publishing your newsletter. Choose Standard Newsletter if you’d prefer to publish it manually. The Automatic Newsletter feature sends out all of your latest posts at a frequency of your choosing. If you only want to send out the posts you use the Feed to Post extension on, you’ll need to use the Standard Newsletter feature and add the WordPress Post module to your newsletter manually. This allows you to select the post(s) you used the Feed to Post extension on. Goodbits is a service you can use to send out newsletters filled with links you’ve collected from the around the web. You create “buckets” and fill those buckets with links. You can add links to your buckets manually or use the service’s browser extension. All you need to do is drag the links you’ve collected over to your newsletter when you want to publish a new issue. Goodbits is free for up to 200 subscribers. Premium plans are available for as low as $6/month. 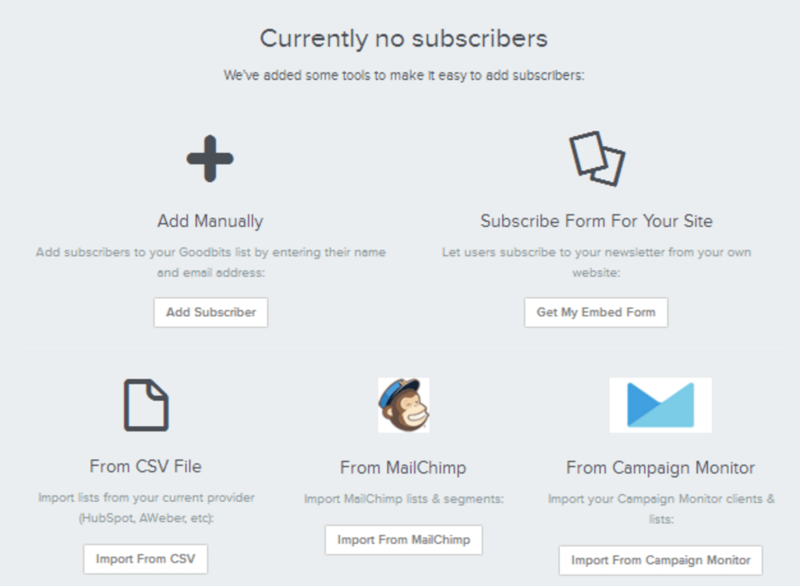 You can add subscribers manually, embed a Goodbits form on your site or import subscribers in a CSV file or from MailChimp and Campaign Monitor. After you create an account, you’ll be given a default newsletter and the draft of your first issue. 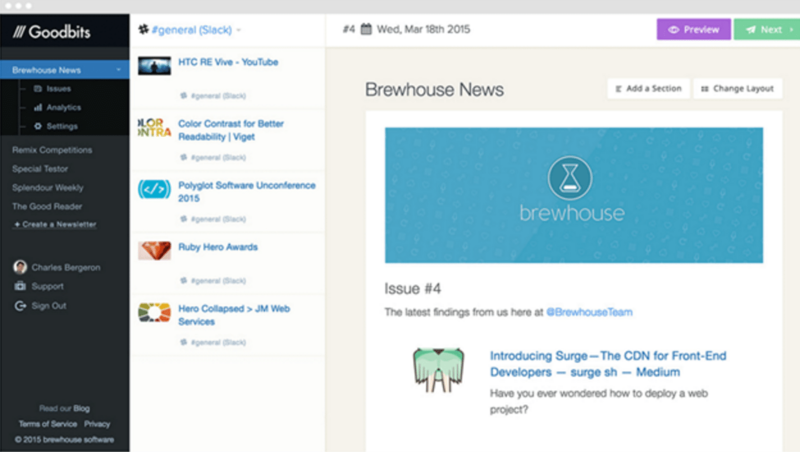 You can click the + button next to your newsletter title in the dashboard to the left to create new newsletters. Click the green button in the top, right-hand corner of the screen to create new issues. 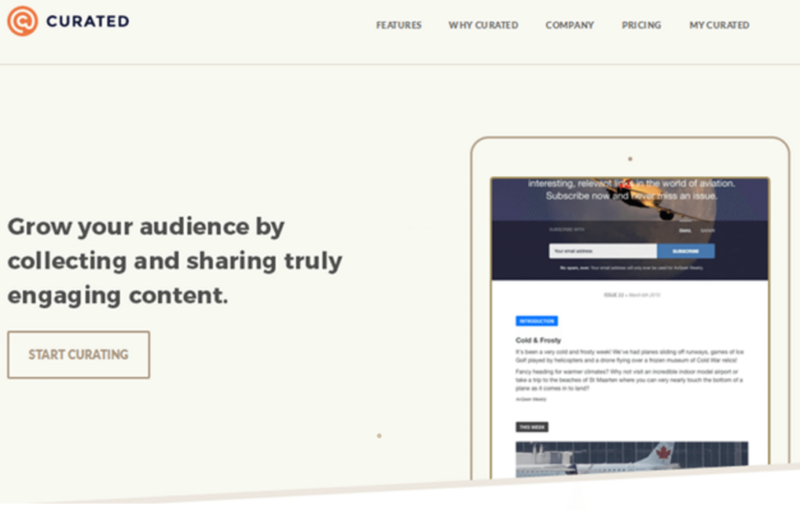 Curated is a premium service whose plans start at $25/month for up to 500 subscribers. After you create an account, you’ll be given a default newsletter to start out with. This comes with a sign-up page potential subscribers can use to subscribe to your newsletter. You can also import subscribers with a CSV file or use Zapier to integrate your account from your email marketing service provider with your Curated account. You can add items (links to news stories) to your Collected Items list using the suggested bookmark link or by adding them in manually. Either way, this is the screen you’ll see when you want to add a new item. 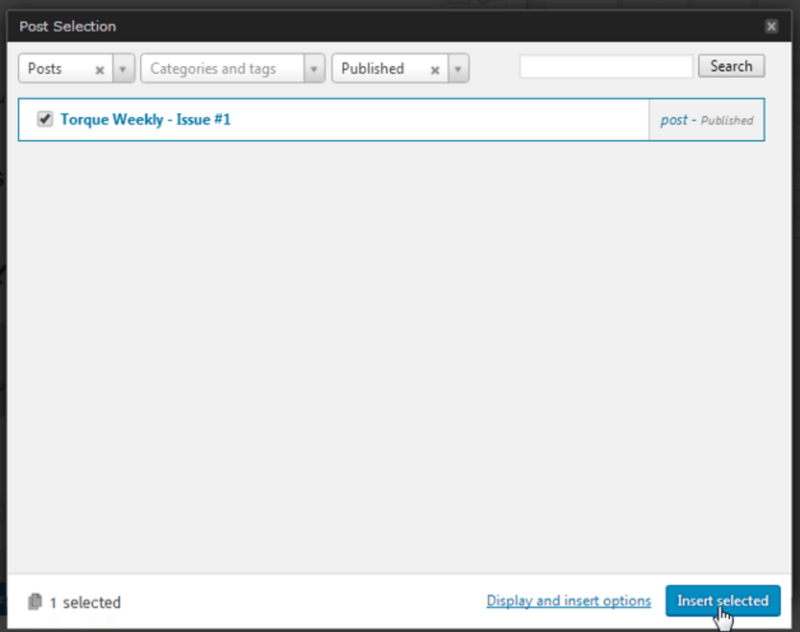 All you need to do is import the items you collected from the list to the left when you want to create a new issue. You can preview the issue by viewing it in your browser or by sending yourself a test email. 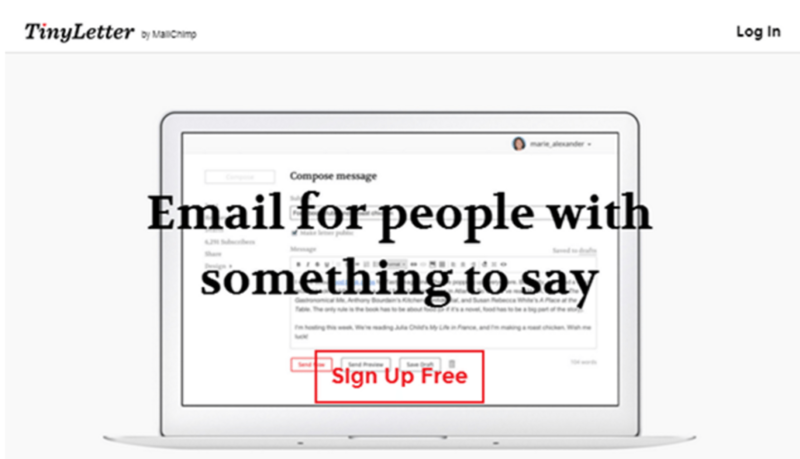 TinyLetter is a free and simple email tool owned by MailChimp. It’s free for up to 5,000 subscribers and does not come with any premium plans. If your list is bigger than that, you’re simply encouraged to migrate your list to MailChimp. 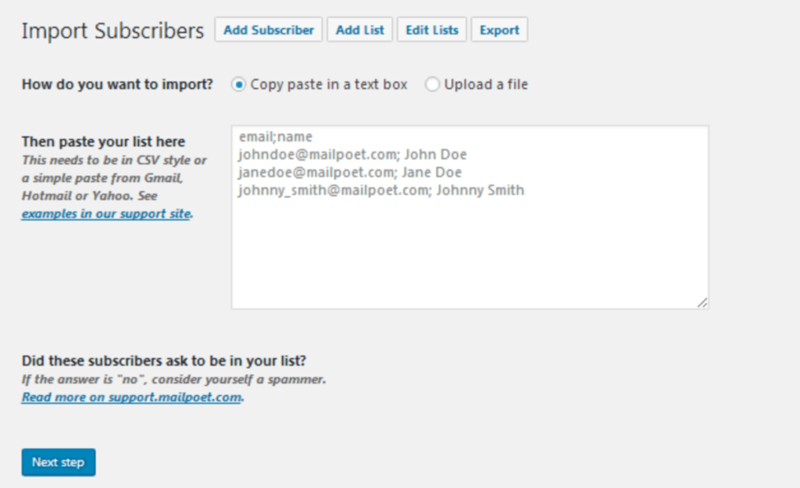 Subscribers can be imported manually, through a CSV file, from Gmail, from a Subscribe page or through an embed form. The service doesn’t give you a way of collecting links as Goodbits and Curated does, so you’ll need to rely on tools like Pocket or Evernote Web Clipper to collect articles on the fly. Unfortunately, this also means you won’t have an easy way of importing articles in your newsletter, so you’ll need to do everything manually. If you don’t want to use a dedicated newsletter tool to publish your issues, you can always go old school and use your email marketing service provider. MailChimp and Aweber are both known for their well-designed, drag-and-drop email templates, which you can use to build a weekly newsletter filled with the best articles of the week. If you subscribe to a Pro plan at Curated, you can export any newsletter you build as an HTML file and import it into your email marketing service provider’s email editor. If you haven’t gotten around to building your email list, yet, make sure you check out our Beginner’s Guide to Using MailChimp for Email Marketing.